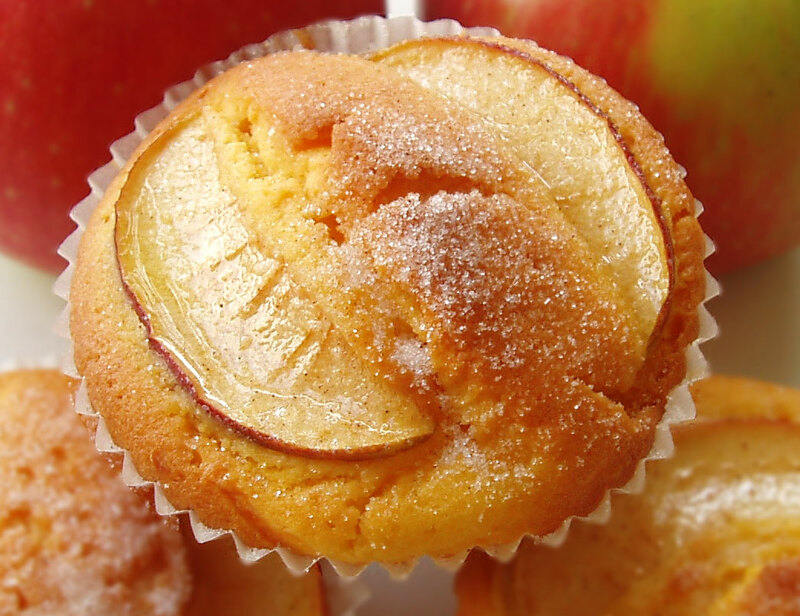 I’ve just been reminded that I promised the recipe for Apple Custard Cupcakes two whole months ago … so here it is (better late than never – sorry!). It’s a winning comfort-food if you were brought up on Bird’s custard powder, but I’m sure that your favourite custard recipe would be an ideal substitution for the filling if you haven’t the same homely associations as I have with licking clean the (Bird’s) custard spoon as a child (usually whenever my Mum was making an orange and Swiss Roll trifle). Line a 12-hole muffin tray with paper cases. Preheat the oven to 180 degrees C.
Make the custard (if you’re going with Bird’s custard powder, mix a little of the milk with the powder, sugar and vanilla; heat the remaining milk until it begins to boil, then pour it onto the custard powder paste; stir to stop any lumps forming (unless you’re a traditional school dinner lady 😉 ), then pour it all back into the saucepan where it will thicken further with the residual heat). In a large bowl, combine the butter, vanilla, sugar, eggs, sieved flour and custard powder. Mix at low speed until all ingredients are moistened, then beat at a medium speed until the mixture becomes a paler colour. Divide half of the cake mixture among the paper cases. Spoon some custard onto each cake, then top with the remaining cake mixture. Spread the mixture to cover the custard. Press the apple slices onto the tops of each cake. Bake in the centre of the oven until golden – about 25 to 30 minutes. Remove the cakes from the oven and brush the tops with melted butter while they are still hot. Sprinkle with a mixture of sugar and cinnamon. Transfer to a wire rack to cool.